The current transformers of the PCE-LCTB 45/21 (40) series are used when alternating currents in circuits are too high to be detected directly by measuring devices. The current transformer converts the primary current into a proportionally reduced secondary current, which can be processed by a measuring device. 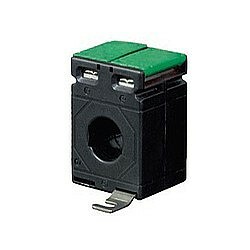 In addition, the current transformer protects connected measuring devices from excessive voltages. The current transformers of the PCE-LCTB 45/21 (40) series can detect primary currents from 50 A to 400 A depending on the model and convert these into a 1 A or 5 A secondary current. In addition, one can select between the accuracy classes 1 and 0.5.